Back from the mountains, I emptied the pockets of my rain-jacket and found these samples. The plant is Arctostaphylos alpinus (Arctic Bearberry, Ripbär), very common in the Scandinavian mountains and also found in NE Scotland. Ripbär is one of the earliest plants to flower in fell-regions. The unobtrusive greenish-white flowers appear as soon as the snow melts, giving maximum time for the berries to ripen. Here you can see the ripening berry: it was green when I picked it and had now turned red, on its way to becoming lustrous violet-black. The berries can be up to 1cm in diameter and look luscious. They are not poisonous, and are sweetish but insipid ("fadd" in Swedish). In the 18th centuiry Linnaeus wrote that the Same picked them, but there have been few subsequent reports of anyone finding a use for them. 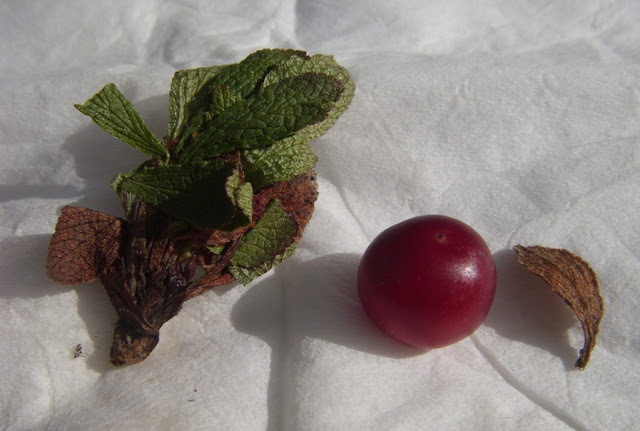 In Örjan Armfelt Hansell's Bärboken, he says that berries left over from the preceding year become agreeably winy. From my sample you can also see how the previous year's withered leaves remain beneath this year's leaves: they now act as insulation from the cold. The plant is said to be the favoured food of the Ptarmigan (Lagopus muta, Fjällripa), which no doubt accounts for the Swedish name Ripbär. A. alpinus in situ. Photos taken on 1st August. In a few weeks the leaves turn a uniform deep red, a major ingredient in the colourful appearance of the fells in autumn. 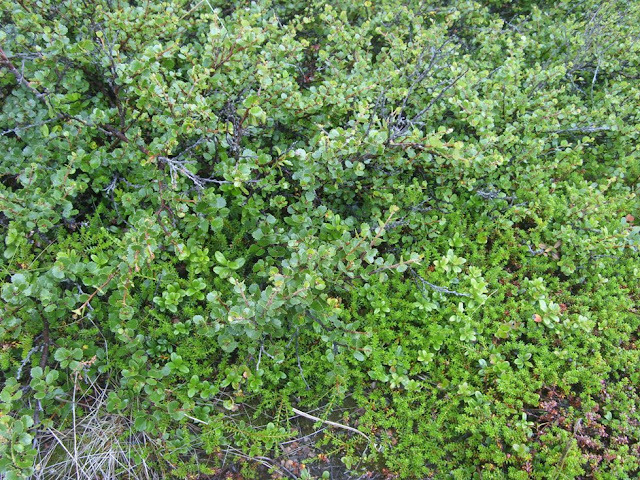 Ripbär and Kråkbär (Crowberry). with a bit of Lingon (Lingonberry/Cowberry) and Dvargbjörk (Dwarf-birch). 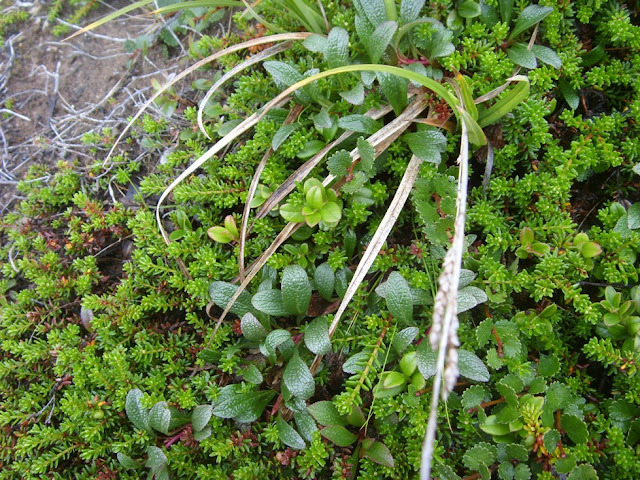 Typical ground-cover in the species-poor areas of the fells: dwarf-birch and crowberry. 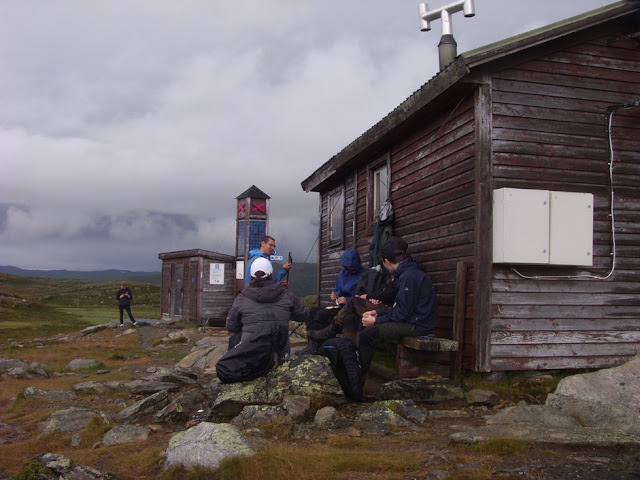 The huts at Spåime, where these photos were taken. These emergency shelters are always built on windy spots where snow doesn't settle, so that people sheltering during a blizzard won't get snowed in. Which explains the presence of Arctostaphylos alpinus, a specialist of the very demanding conditions of "vindblottor", places where the protective winter snow-layer is absent. 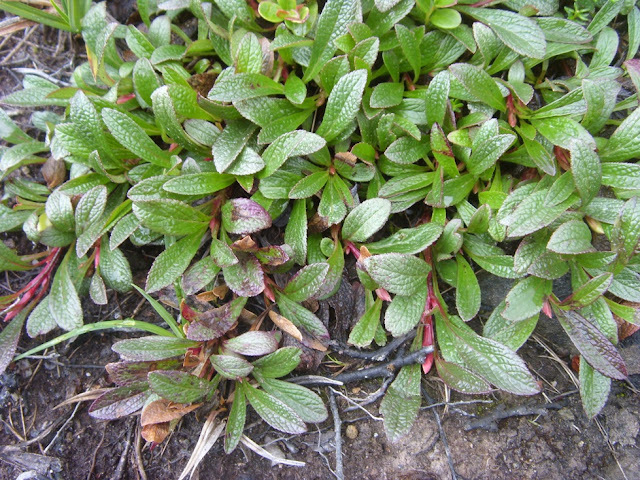 If I'd known what to look for, I would probably have found its companions Diapensia lapponica (Fjällgröna) and Loiseleuria procumbens (Krypljung) too.